If we want to admit guilty pleasures, one of mine was ABC's The Taste, which has apparently and unfortunately been cancelled after three seasons -- and I always rooted for Anthony Bourdain's team. Equal parts best and worst best friend, father figure, and guy you'd want to have a beer with, Bourdain combines high-brow palate with low-brow approachableness, and his tell-all cooking industry books are a riot to boot. Anthony Bourdain plus DC/Vertigo graphic novel is therefore a more-than-natural fit for me, and I've had his Get Jiro (with Joel Rose and Langdon Foss) kicking around here for a while now. With Get Jiro getting a second "prequel" volume in October, the time seemed right for a review. It's probably not a coincidence that Jiro of Get Jiro shares a name with famed sushi chef Jiro Ono, subject of the recent documentary Jiro Dreams of Sushi, a theory emboldened by this picture on Bourdain's Facebook page. Though not imperative, a viewing of the documentary might benefit a Get Jiro reader; similarly these fairly short Food Network and Eater videos on sushi, which I coincidentally happened to watch before reading Jiro, also added to the reading experience. The reason is that, for 160 pages, Get Jiro is about 30% post-apocalyptic gangster-chef action bloodbath, and 70% painfully slow three-or-four-panel pages that are entirely about the food. If you ever wondered how a comic book "camera" could accomplish a cinematic "longing gaze," wait until you see how Bourdain and Rose, with artist Foss, linger over the preparation of sushi, or pot-au-feu. And when a doomed customer makes all-too-familiar faux pas over Jiro's sushi, the book assumes enough of a foodie in the reader not to explain the problems, which is where those pre-reading videos might be of service. 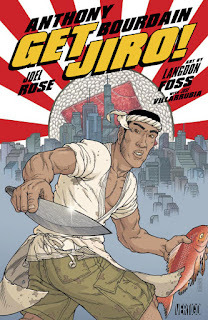 Jiro finds the title character in a tug-of-war between fast food chef Bob and vegetarian chef Rose, in a futuristic world where rival chef gangs battle for control. In response to the two gangs' bullying of smaller chefs, Jiro agrees to work for each, then double-crosses them both and sets them against one another. It is, to be sure, a take on Fistful of Dollars with chefs, or to be more accurate Kurosawa's Yojimbo, though I'm sure Get Jiro wouldn't balk at being called a "spaghetti western." In the book's ridiculously bloody violence, there's surely some Quentin Tarantino, but even that is likely a callback to the original material. The book benefits from a familiar plot because to a great extent plot takes a backseat here to both the food fetishism and the parodic elements. What makes sense when a stranger rides up on a small Old West town doesn't quite translate to Bourdain and Rose's futuristic venue; Bob and Rose control in-demand restaurants, to an extreme degree, but it's unclear, say, if people are allowed to cook for themselves, whether people would starve without Bob and Rose (they don't seem to be starving), why some rival restaurants are tolerated and not others, and so on. If these elements were important for the story, this would be a problem, but it's the absurdity and not the social science that's the draw here. Among the writers' most clever bits are when they play cooking against the tropes of the genre, as in when Jiro lops off a gang member's arm and his fellows halt the fight to admire Jiro's cut off the bone. Similarly some of the worst torture Jiro receives at the hands of the chef-warlords is to be force-fed "protein-free meat substitute"; one can almost hear Bourdain's revulsion in the background, and surely there's some of the author's personal sentiment behind Bob's complaint that he must cook for the masses, so to speak, in order to afford fine cuisine for himself. And there must be more than a little Bourdain in enemies coming together in the end over a basic taco cart. If from the packaging Get Jiro seems samurai story, action flick, or heist movie, one can probably find better examples elsewhere. Get Jiro is a food comic with Anthony Bourdain's name on it, and those most likely to be satisfied by this title are the ones coming in for that reason and that reason only.